I absolutely am a fan of simple food, made well, and tasty. It is my favorite way of eating. I also love yams and sweet potatoes. I realize by not frying them, they don’t get crispy like a potato fried in oil. But I eat yams and sweet potatoes on a weekly basis, and I can’t eat fries like that. Well, I could, but that may not be the best idea. So I added the cornmeal crust to provide some crunch, and paired with the most simple dip you could imagine. Avocado lime dip, that takes all of about 5 minutes to prepare while the potatoes are baking. I have eaten these with a simple salad for a light weeknight meal, and a burger for more filling weekend meal. Either way they are healthy and yummy for any day of the week! The key to keeping these as crispy as possible, cut them the same size. Even though we are baking them, and they don’ get super crispy, they get crisp enough, and keeping them the same size helps in that endeavor. 1. In a large bowl, add the potatoes, and salt, toss to combine. Add olive oil, toss to combine. Add cornmeal, toss to combine. Spread onto a parchment lined baking sheet pan. I used 2 pans, so the potatoes are not touching while baking. Bake for 30-35 minutes, or until tender. 2. In a small bowl, add the avocado, using a fork, smash the avocado into a course mixture. It does not need to be perfectly smooth, leave some chunks. Add lime juice, salt, and pepper, mix to combine. 3. 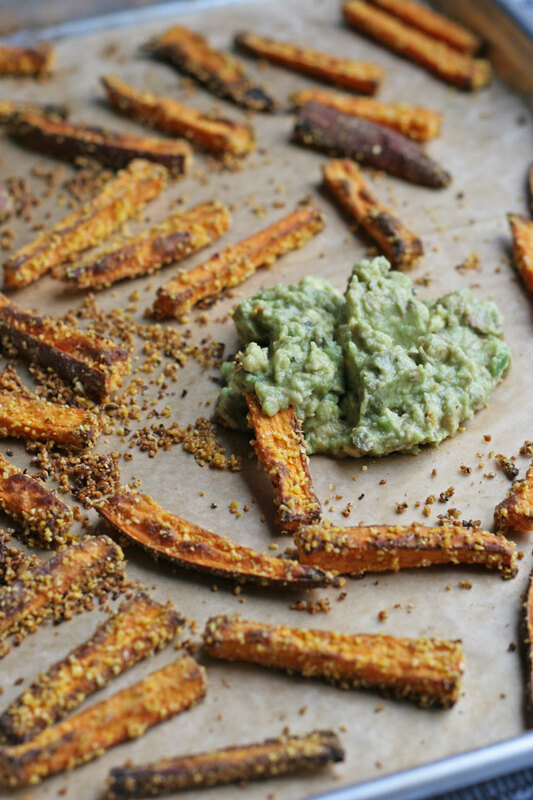 Serve fries warm with avocado lime dip.